His 1704 marriage to Abigail/4w Bateman, a descendant in the Woburn line of Henry/1 Brooks, marks the first intermarriage in New England between these Brooks lines. Findagrave.com, memorial #20645819. Photo by Bill Boyington. [S282] John Brooks Threlfall, "Thomas Brooks," 12. [S185] Concord, Massachusetts Births, Marriages, and Deaths, 1635–1850, 432, Joseph Brooks d.: "in the 76th year of his age, July 11, 1746." [S282] Threlfall, "Thomas Brooks," 12: "about the fall of 1670 at Concord." [S475] Roy I. Brooks, "The Mortimer Wilson Brooks Line, 1610-1985," 1, Joshua (II): "Joseph, born September 16, 1671, married (1) Abigail Bateman." [S282] Threlfall, "Thomas Brooks," 13. [S185] Concord BMD, 60, Joseph Brookes/Abegail Bateman m.
[S185] Concord BMD, 68, Abegail Brooks d.
[S185] Concord BMD, 66, Joseph Brookes/Rebeckah Blodgit m.
[S83] Henry Bond, Watertown Genealogies, 2:722. [S572] William Gray Brooks, "A Genealogical Account of the Brooks Family," 60. [S185] Concord BMD, 432, Joseph Brooks d. (g.s.). 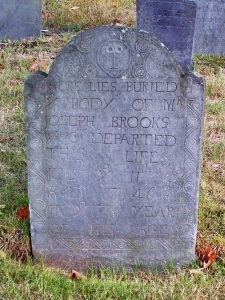 [S2363] Concord Gravemarker Data, OHBG-339, Mr. Joseph Brooks. [S188] Vital Records of Lincoln, Massachusetts, To the Year 1850, 156, wid. Rebekah Brooks d.
[S182] Lemuel Shattuck, History of the Town of Concord, 317, biographical notice. [S282] Threlfall, "Thomas Brooks," 9. [S83] Bond, Watertown Genealogies, 2:720. [S185] Concord BMD, 62, Mara Brookes b. [S185] Concord BMD, 67, Hanah Brookes b. [S185] Concord BMD, 71, Rebecca Brookes b. [S185] Concord BMD, 75, Joseph Brooks b. [S185] Concord BMD, 82, Nathan Brooks b. [S185] Concord BMD, 88, Amus Brooks b. [S185] Concord BMD, 96, Jonas Brooks b. [S185] Concord BMD, 102, Isaac Brooks b. [S185] Concord BMD, 111, James Brooks b. [S210] Edward P. Johnson, Woburn Records, 1:22, Rebecca Blogget b. [S185] Concord, Massachusetts Births, Marriages, and Deaths, 1635–1850, 66, Joseph Brookes/Rebeckah Blodgit m.
[S308] Thomas W. Baldwin, Vital Records of Cambridge, Massachusetts, To the Year 1850, 1:49, Mary Batherick b. [S185] Concord, Massachusetts Births, Marriages, and Deaths, 1635–1850, 166, Isaac Brooks/Mary Bathrick m.
[S881] Roger D. Joslyn, ed., Vital Records of Charlestown Massachusetts To the Year 1850, 1:469, Isaac Brooks/Mary Bathrick, int. [S182] Lemuel Shattuck, History of the Town of Concord, 365. [S167] Franklin P. Rice, Worcester County Warnings 1737–1788, Isaac Brooks, Bolton. [S198] Franklin P. Rice, Vital Records of Bolton, Massachusetts, To the end of the year 1849, 114, Mary Brooks/John Glazier m.
[S282] John Brooks Threlfall, "Thomas Brooks," 12: "and she m. (2) 21 Oct 1760, John Glazier of Lancaster." [S1562] Grace Olive Chapman, "Glazier Family," 5, John (6.) Glazier. [S130] Henry S. Nourse, Lancaster Records, 93, Children of Isaac & Mary Brooks. [S1562] Grace Olive Chapman, "Glazier Family," 6, John (6.) Glazier.